Yankees Hall Of Fame catcher Yogi Berra died Tuesday in West Caldwell, New Jersey, according to The New York Times. He was 90, and made his first appearance in a Major League baseball game exactly 69 years ago yesterday. 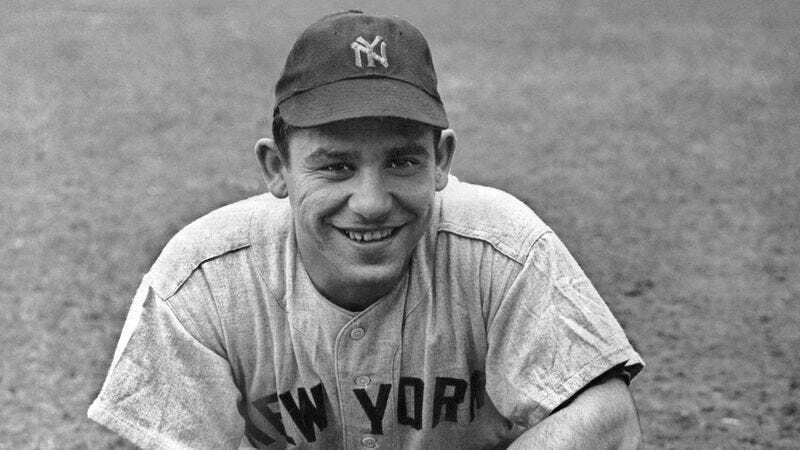 Over the course of his 19-season career, Berra led the Yankees to 10 World Series titles and made the All-Star game 18 times. He held a career batting average of .285, racking up 358 home runs and 1430 RBIs. He also won the American League MVP awards three times, and was elected to the Baseball Hall Of Fame in 1972. Berra was not only one of baseball’s best all-time catchers, but also one of its biggest characters, coining countless slightly off “Yogiisms,” like “It ain’t over ‘til it’s over” and “It’s déjà vu all over again.” Other famous phrases that can be attributed to Berra include “Nobody goes there anymore. It’s too crowded,” and “You can observe a lot by watching.” Berra was also the namesake inspiration for beloved cartoon character Yogi Bear, who made his first appearance in 1958. A St. Louis native, Lawrence Peter “Yogi” Berra was born May 12, 1925 to Pietro and Paolina Berra, both of whom were originally from Italy and who had arrived in America via Ellis Island. He grew up on the same block as friend and later competitor Joe Garagiola and eventual hall of fame Cardinals broadcaster Jack Buck. After dropping out of school in 8th grade, Berra started playing baseball for American Legion teams, eventually earning the nickname “Yogi” from a couple of friends who told him he looked like a Hindu yogi with crossed arms and legs whenever he sat around waiting to bat. Berra signed to the Yankees in 1942, and he was quickly assigned to the team’s class B minor league outfit, the Norfolk Tars. He played there for a season or so before shipping off with the U.S. Navy in World War II, where he took part in the D-Day invasion of France. Following his service, he headed back to baseball, playing with the Newark Bears and finding a mentor in fellow Hall Of Famer Bill Dickey. Berra was called up to the big leagues in 1946, playing his first game with the Yankees in September 22, 1946. He ultimately became a starter for the team, playing in at least 100 games a year from 1948 to 1960 and teaming up with fellow Yankees like Joe DiMaggio and Mickey Mantle to take the Yankees to 14 World Series, 10 of which the team won. Berra also caught Don Larsen’s perfect game in the 1956 World Series, one of only two no-hitters ever thrown in the postseason. Berra retired after the 1963 World Series and was immediately tapped to coach his beloved Yankees. He was fired after a year—though the Yankees made the series—and headed across town to become a position coach for the Mets. He stayed there until 1975, becoming the team’s manager in 1972. He then went back to the Yankees as a position coach until 1983, and managed the team for the 1984 and 1985 seasons before being summarily dispatched by team owner George Steinbrenner, a move that led to a rift between Berra and the Yankees that lasted almost 15 years. Berra’s No. 8 was retired by the Yankees in 1972, and in 1988, Berra was honored with a plaque in Yankee Stadium’s Monument Park. Berra also has both a museum and a stadium named in his honor at New Jersey’s Montclair State University, with the Yogi Berra Museum And Learning Center holding several game-used Berra artifacts, like the mitt Berra used to catch Lemon’s perfect game. Berra is survived by his three sons—Tim, who played professional football for the Baltimore Colts; Dale, who played infield for the Yankees, Pirates, and Astros, and Lawrence Jr. His wife of 65 years, Carmen, died in 2014.